The 563rd Flying Training Squadron was part of the 12th Flying Training Wing based at Randolph Air Force Base, Texas. It operated the T-43 Bobcat conducting navigator training. It was most recently inactivated at a ceremony held at Randolph Air Force Base on November 15, 2010. The 563rd was first activated as a bombardment squadron in 1942 at Gowen Field, Idaho. It transferred to Wendover Field, Utah in early 1943 to train in Boeing B-17 Flying Fortress aircraft. In the spring of 1943, the unit deployed to RAF Knettishall, England. As part of the Eighth Air Force, the unit flew several combat missions from 17 July 1943 to 21 April 1945 over Germany, France, Poland, Belgium, Norway, Romania and the Netherlands. While in combat, the unit received two Distinguished Unit Citations: one for the Regensburg raid on 17 August 1943, and another for separate attacks on Hanover, the Ruhr, and a shuttle-bombing raid. After V-E Day, the unit transferred back to the U.S. awaiting movement to the Pacific Theater of Operations, but the Japanese surrender altered these plans and the unit was inactivated in August 1945. The squadron was reactivated in the reserve from 12 June 1947 to 27 June 1949, flying the North American AT-6 Texan, Beechcraft AT-11 Kansan, Curtiss C-46 Commando, Douglas C-47 Skytrain, and Douglas A-26 Invader at Orchard Place Airport, Illinois. The 563rd was reactivated again in 1953 following Secretary of State John Foster Dulles' promise to provide NATO with four fighter wings. The unit became a fighter-bomber squadron at Clovis Air Force Base, New Mexico, 23 November 1953, where its members trained in North American F-86 Sabre aircraft. The squadron moved to Bitburg Air Base, Germany, in 1954, and then to Étain-Rouvres Air Base, France, in the summer of 1955. The unit flew support for the Suez Canal and Hungarian crises. It converted to North American F-100 Super Sabre aircraft on 2 April 1957 and was inactivated shortly after on 10 December 1957. The squadron was reactivated 1 May 1962, as the 563rd Tactical Fighter Squadron, at McConnell Air Force Base, Kansas, again flying the F-100 Super Sabre and then the Republic F-105 Thunderchief by the end of 1963. In April 1965, the unit was sent into combat in Southeast Asia. The 563rd deployed to Takhli Royal Thai Air Force Base, Thailand, and flew 1508 combat sorties over North Vietnam and Laos. On 27 July 1965, the unit participated in the first destruction of a surface-to-air missile site in North Vietnam. In addition, there were several attacks as part of the first increment of Operation Rolling Thunder, and other Operation Iron Hand missions, and several dangerous attempts to destroy the Thanh Hoa and Paul Doumer bridges. The 563rd lost 10 of its original 18 F-105Ds. Two pilots were killed by enemy action and three became Prisoners of War in that five-month tour. The 563rd was awarded two Air Force Outstanding Unit Awards with Combat "V" Device for this tour, and was the most experienced squadron in the U.S. Air Force. (The 563rd never received its Vietnam Cross of Gallantry with Palm citation though because its mission was classified.) In 1966, the squadron became a replacement training unit back at McConnell. The unit trained ten classes of pilots for the F-105D between 1966 and 1970 and later transitioned to the F-105 "Thunderstick II" until its inactivation, 31 July 1972. On 31 July 1975, the 563rd was reactivated for the fifth time at George Air Force Base, California. The unit initially flew "Thunderstick II"'s but added McDonnell F-4 Phantom IIs in September 1975. In October 1978, the 563rd received new aircraft from Nellis Air Force Base, Nevada, to become the first operational squadron to fly the advanced F-4G Wild Weasel. 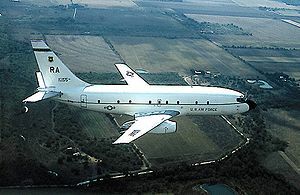 The unit served with this electronic warfare aircraft in many exercises until it was inactivated in October 1989. On 14 May 1993, the 563rd was redesigned as a flying training squadron and reactivated at Randolph Air Force Base, Texas. The squadron was assigned to the 12th Flying Training Wing under Air Education and Training Command. In conjunction with the 562nd Flying Training Squadron, it operated the Boeing T-43 Bobcat aircraft conducting electronic warfare officer and combat systems officer training in electronic attack, threat reaction, and electronic surveillance. The 563rd also operates the state of the art T-25 Simulator. George Air Force Base, California, 31 July 1975 – 5 October 1989. ^ Aircraft is Republic F-105D-31-RE Thunderchief, serial 62-4386 in 1965. ^ Aircraft is McDonnell Douglas F-4E-43-MC Phantom, serial 69-7254 in F-4G Wild Weasel configuration. It awaits its turn at Mojave for conversion to a 'Red Tail' target drone. The white fin cap indicates the aircraft was assigned to the 563rd TFS. Converted to QF-4G AF-209. Expended 4 June 2002. ^ a b c Robertson, Patsy (19 March 2008). "Factsheet 563 Flying Training Squadron (AETC)". Air Force Historical Research Agency. Retrieved 19 October 2018. ^ a b c d e f "563 FTS Fact Sheet". Archived from the original on 20 July 2011. Retrieved 3 December 2008. ^ a b c Lineage information, including assignments and aircraft, through 2007 in Robertson. ^ Station information through 2007 in Robertson, except as noted. Anonymous. A Brief History of Randolph Air Force Base and the 12th Flying Training Wing (PDF). Randolph AFB, TX: 12th Flying Training Wing Office of History. Retrieved 19 October 2018.